Briton Ferry Docks is one of Isambard Kingdom Brunel's unique engineering structures. The dock was constructed after 1853 to the design of the world famous engineer and opened in August 1861 - two years after Brunel's death in 1859. Brunel also masterminded the construction of the Great Western Railway and his unique floating dock at Briton Ferry which opened in 1861. To celebrate the 175th anniversary of the founding of the Great Western Railway, the Brunel Dock Society with Neath Port Talbot County Borough Council and the Balmoral Pleasure Ship run by Waverley Trust organised a special day cruise. 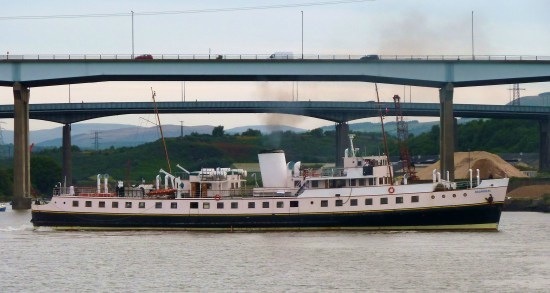 Sailing from Briton Ferry across the Bristol Channel to Ilfracombe and the Devon Coast, it is the first cruise of its kind for nearly 70 years. If you want to see Brunel's floating dock and the surrounding area of Briton Ferry regenerated, why not join the Briton Ferry Brunel Dock Society. Regular talks are held and with major event like this help to keep this project in the public arena. It might seem ambitious and challenging to achieve this, but so was Brunel and we owe it to him as one of the greatest engineers the world has known.